One of the best conference races in the country took place in the Atlantic Sun, and it wasn’t settled until the conference tournament. Four teams ended up tying for first place at 14-6, including Lipscomb, Campbell, Belmont and Jacksonville, while East Tennessee State finished one game back at 13-7. Lipscomb won the tie-breaker and the top seed, with Jacksonville nabbing the second spot, and Belmont and Campbell following them. In the conference tournament, the best team that didn’t finish tied for first emerged the victor. ETSU was certainly helped by Kennesaw State upsetting the No. 1 seed and Mercer making a run to the title game, but the Buccaneers won the conference tournament before losing to Kentucky. Will we see another great title race? 1. East Tennessee State: Last year’s tournament champion returns four starters and brings back forward Mike Smith from a season-ending injury. 2. 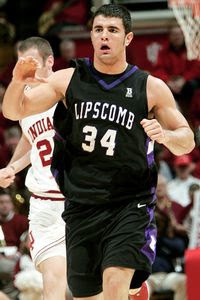 Lipscomb: The Bison have the league’s best inside-outside duo in Player of the Year Adnan Hodzic and guard Josh Slater. Jordan Burgason can score. 3. Belmont: The Bruins return four starters from a team that tied for the league title. Ian Clark can shoot from three and Mick Hedgepeth is improving. 4. Jacksonville: The Dolphins will have to replace Ben Smith and Lehmon Colbert, who were the team’s most productive players. Ayron Hardy is solid. 5. Kennesaw State: The Owls showed their potential last season, upsetting Lipscomb in the tournament. Markeith Cummings is a tough forward. 6. Campbell: Without highly-productive forward Jonathan Rodriguez, the Camels will have to rely on the backcourt of Lorne Merthie and Junard Hartley. 7. North Florida: The Ospreys will look to take another step forward in their second year of eligibility. They are balanced, but they need to improve offensively. 8. Mercer: The Bears had two of the league’s best players in James Florence and Daniel Emerson, but they are gone. Jeff Smith is the top returnee. 9. Stetson: The Hatters relied in a big way on their freshmen last season, and those players now have a year under their belt. Look for Ridge Graham. 10. Florida Gulf Coast: While they are not eligible for the conference tournament yet, the Eagles have solid parts in Anthony Banks and Reed Baker. 11. USC Upstate: The Spartans finished last in the conference last season, and it doesn’t look much better this year. They do have plenty of newcomers, though.